One of the best and most pleasurable ways of improving your playing is to participate in jam sessions. This is not necessarily as simple as walking up to other musicians and playing along with them. Common sense and courtesy will get you a long way. Figure out if the session you are thinking of joining is an “open” session at which anyone is welcome, or a “closed” session where the participants want to play only with each other. Never play loudly into anyone’s ear. 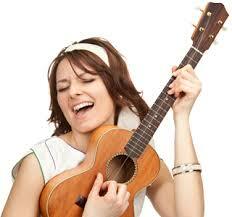 Especially if you are just a beginner, play along softly in the background until you are invited to lead a tune. Bring in common denominator tunes rather than “jam busters” that no one has a clue how to play along with, unless the session is open to obscure tunes. However, there’s more to it than that: different kinds of music have their own expectations as to what the proper behavior is in a jam session, and you have to know what type of jam session you are getting into. In most old timey or Irish music sessions everyone plays at once. A “hosted” jam session is one where a designated musician determines what is to be played and starts and ends the tune. In a “circle jam” someone agrees to start the first tune, and also to end it. The next person around the circle starts and ends the next tune, and so on around the circle. In some jam sessions, anyone can start, and it ends when someone plays a strong ending cue, or it may just naturally die when everyone gets tired of it. This is a great format for beginner players who are too shy to play solos. In a bluegrass jam session, everyone takes turns around the circle, and usually plays the tune through just once. It isn’t considered proper to play along loudly during someone else’s break. Typically, a bluegrass jam will be limited to one or at most two representatives of each lead instrument: fiddle, mandolin, banjo, etc. Often two fiddlers may choose to play twin parts. 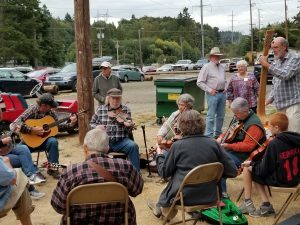 Bluegrass jams usually involve lots of songs as well as instrumentals, and there may not be enough instrumental breaks between the verses of the song to give each instrumentalist a solo. One solution is to add extra instrumental breaks before the final chorus, and this may require someone to act as a leader. Usually the person that starts a tune decides when it should end. This format is great when you feel confident enough to show off a bit, because no one else will drown you out. In swing jam sessions and bluegrass jams, the usual format is to trade solos while other participants play back, or fills, which support the lead rather than compete, playing with attention to dynamics that gives the ensemble sound desired.. 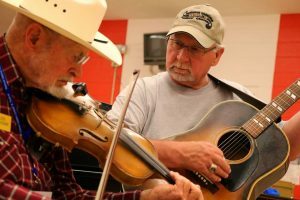 In a Texas fiddle jam one fiddler often plays a tune through as long as he or she wants, and then turns it over to another fiddler who does the same thing. This is an even better show off technique, since each fiddler has unlimited time to spin out ever more fanciful variations. The down side is that it tends to wear out the guitar player. I have limited experience with Cape Breton jam sessions, but they seem to run something like this: one fiddler starts out a tune, and the others play along if they know it. After a couple of times through the tune, the same fiddler goes into another tune, usually in the same key. The original leader may continue to lead all the tunes of a long medley, or may turn it over to another fiddler. The medley goes on until the fiddlers get tired or run out of ideas. There are other types of jam sessions, but these are the ones with which I am most familiar. When observing a jam session, see if it conforms to one of these models, or follows a different one. Once you’ve figured out the ground rules, get rid of those fears and inhibitions, join in and have fun!